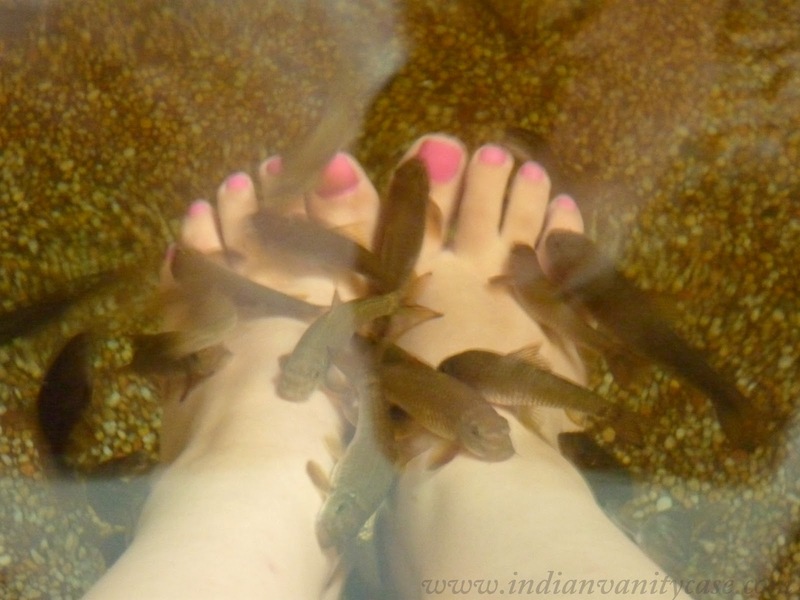 Indian Vanity Case: Fish Spa After Watching Piranha...Aaaahhhh! Fish Spa After Watching Piranha...Aaaahhhh! 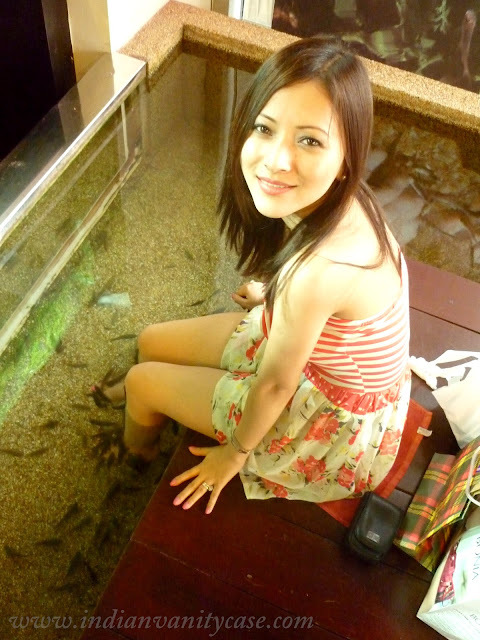 Fishes nibbling at your legs sound cute in your head, but when a swarm of them come at you all at one time....OMG! I was scared sh*tless! They were just waiting there! Waiting to relish you! 2 seconds after I dipped my feet the first time, I retracted so fast and it took me a while to get my feet back in there. I actually thought about leaving! After a while, I calmed down and wasn't as terrified as I was before. I just didn't look at them. No, they don't hurt you at all :). They just nibble, kinda ticklish but not haha ticklish. There's a separate part/section with bigger fishes you can go to after you're comfortable with the small ones, but "hell! I ain't going there!" That big one looked like it's trying to talk to me =D "heyy-oh"
Fish Spa ~ Pavillion Mall, KL, Malaysia. Price ~ RM 38 (Rs.560 approx) for 30 mins. **There's a Fish Spa in Delhi too, in Select City Walk Mall. But I've never been there. I thoroughly enjoyed reading it Cynthia..Have never tried fish spa at all, but would love to. There is one here called Kenko, but never heard any good revs on it. Firstly Thank you for recommending Piranha , you know how much i love horror movies. You look darn pretty in pink!! and i can't believe that legs became so glossy and shiny!! is it really because fish nibbled... Wow. Thanks for introducing me to Piranha. I love watching scary movies and I am excited to watch it because it's from the director of The Hills Have Eyes, iMO one of the movies that keeps you mum and scared !! I went for the same thing here in Bangalore-Kenko (its a franchise of one in Singapore) ...it was hilarious experience. I went with my gal gang...so it was awesome fun. But I couldn't keep my feet in for 30 mins. I loved fish manicure more, probably coz I got it done after my feet so got use to fishes.